AnybodyOutThere is a new communication platform that offers an instant and relevant response to your thoughts and questions by connecting you with the right people. Post a question, thought or topic, of up to 110 characters, that best describes what's on your mind then click the "Post" button. 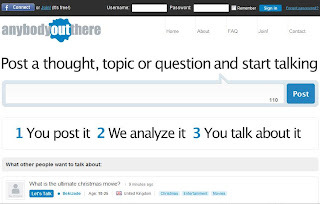 AnybodyOutThere analyzes your post and provide you with a list of people who are eager to talk about the same subject. When you find someone on the list that you'd like to talk to, click the "Let's Talk" button next to the user's nickname. A chat request will then be sent to the user. And if s/he accepts, a chat window will open. AnybodyOutThere is not a social network. You don't need friends to use it nor does its effectiveness rely on you accepting friend requests. The service allows you to translate a conversation into 43 languages (powered by Google) making it easier to talk with anyone anywhere in the world. AnybodyOutThere's Instant Messenger (IM) Agent allows you to interact directly with the site from your favorite IM client. Using the IM agent allows you to keep in touch with our site while browsing the web and without actually visiting the site.